Annular, Penannular, Ring, and Open Ring Brooches? What the heck are they talking about? All I want is something that works! How many times have I heard comments like those? Lots! But let’s try to unravel the confusion – it really isn’t that complicated. Why bother? I like knowing the correct names of things, but more important, if you ever want to do research on these sorts of brooches, you need to know what to call them when you go to the web or the index of a book. As with many historical items, these types of brooches have two sets of names, based at least partially on where the writer lives in the world. In Europe, and among some American academics, they are called Ring Brooches and Open Ring Brooches. Others, mostly in America, choose to call Ring Brooches – Annular Brooches, and Open Ring Brooches – Penannular Brooches. According to Harold Newman, in “An Illustrated Dictionary of Jewelry” Penannular Pin Brooches must have “a long pin whose length is at least double the diameter of the circle.” My personal research has not found any sort of consistency among authorities in the use of these terms. For the sake of simplicity, I’ll use the terms Ring Brooch and Open Ring Brooch– as they are fairly straight forward descriptive terms that can help eliminate confusion. So what do they look like? Well a Ring Brooch is simply a solid ring with a pin and an Open Ring Brooch is just a giant almost closed “c” shape with a pin. But more on that later! According to the Metropolitan Museum of Art the Open Ring Brooch was developed by the Iron Age Celts of Britain. The gap between the two sides of the brooch gradually became smaller, was then filled with a bar. The bar widened to become a complete ring and the Ring Brooch developed. Whether this is completely accurate or not, the open ring brooch can be reliably dated to at least the 1st century BC and ring brooches to at least 3 AD. What were Ring and Open Ring Brooches Used For? …Just about anything that we would use a button for – like closing the neck opening of a tunic, or holding a cloak closed. I know people who use them to close their shawls or brats, and modernly fancy versions are sold to hold women’s knit lace shawls closed. Archaeologists find large numbers of tiny (less than 1 inch in diameter) Ring brooches during the 15th and 16th centuries. It is believed that they were used to attach portions of the undergarments and layers of clothing together. It’s particularly common to find one on each leg for men – to attach the hose to the under drawers. Ring Brooches lie very flat and would not open by themselves. In addition to practical uses as closures, these brooches were often used purely for decoration. There are many thousands of decorative Ring and Open Ring brooches. The materials and level of decoration on these brooches ranges from simple cast lead or tin brooches, made in the style of pilgrim’s badges, to solid gold enameled and engraved brooches of the highest quality and craftsmanship. There are, of course, also many intermediate level brooches – simple silver brooches with cast, stamped or engraved designs. These brooches often included inscriptions on the back that were designed to protect the wearer. These inscriptions could be used in their full form, or in the form of abbreviations. One commonly used example of this type of inscription are the words “Ave Maria Gracia Plena” – the “Ave Maria” of the rosary – abbreviated as A M G P. The names of the three Magi – Caspar, Melchior, and Balthasar, were also considered to be very prophylactic. This inscription is often found in the form C M B. The letters in either abbreviation may be left with simple spaces between them or separated by dots or asterisks – as in the following example: *A*M*G*P*. Ring and Open Ring brooches come in many shapes, but the principal behind the use of all of the shapes is the same. 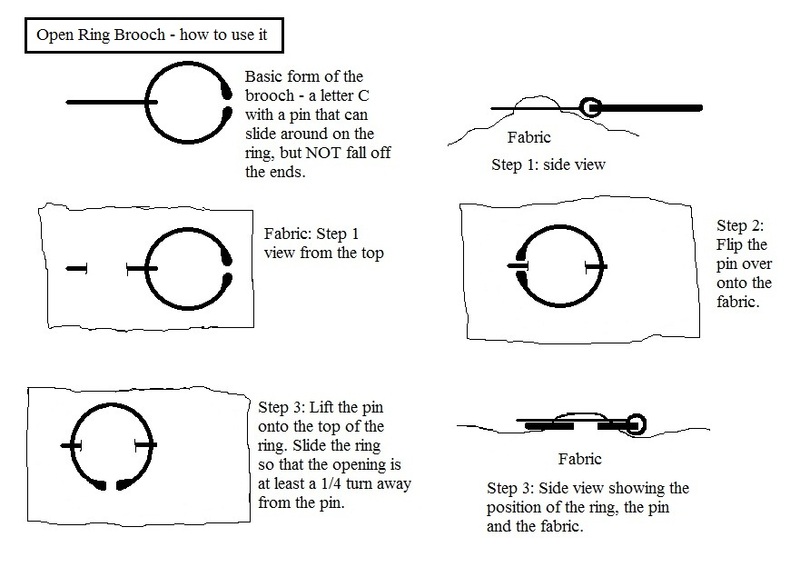 A Ring brooch forms a complete ring – therefore the fabric must be pulled up through the center of the brooch before the pin can be inserted through the fabric. The Open Ring brooch has a break in its outside ring, which means that the pin is inserted through the fabric before the end of the pin is placed up on the ring. This is an example of just a few of the sizes and forms that basic Open Ring Brooches come in. 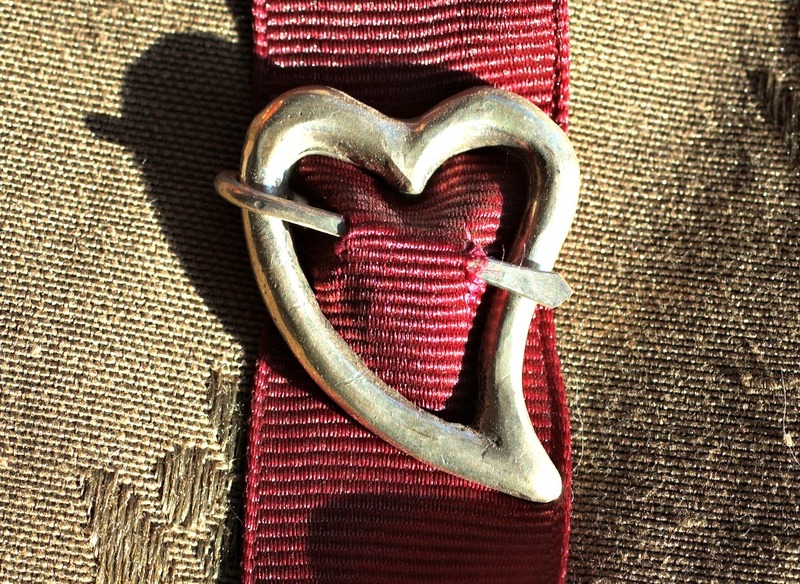 This example of a Ring Brooch is in the form of a heart. Ring, simply means a closed ring, but the ring does NOT have to be round. I hope that this helps give you a better understanding of Ring and Open Ring and Annular and Penannular Brooches, and how they work!